Courtesy of Colorado Farm to School Task Force. The Colorado state legislature has taken the first step towards passing a bill supporting statewide farm-to-school programs. House Bill 15-1088 seeks to build the capacity of farmers by helping them overcome economic hurdles and connect with school districts interested in serving fresh, local products to their students. The bill was introduced by Representative Faith Winter and passed the House Education committee last month. 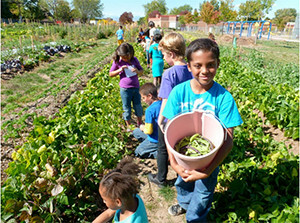 Starting in 2006, surveys done by the Colorado Institute of Public Policy and Spark Policy Institute consistently identified the same strengths and needs as the state worked towards expanding farm-to-school programs. School districts proved to be fully on board. Surveys of school nutrition directors revealed that, “there’s a huge awareness and high demand on the school side,” according to Lyn Kathlene of the Spark Policy Institute. Producers, especially small producers, were also excited to sell to districts. However, both school nutrition directors and producers expressed concerns about food safety requirements and financial considerations. According to Kathlene, a recent Colorado State University Extension survey revealed that meeting safety requirements “costs producers with fewer than 100 acres four times as much per acre as it costs larger producers.” Yet smaller farms also consistently express more interest in working with public school systems. While Colorado farm-to-school advocates have been working on making safety practices more small farm-friendly, they also began to discuss legislative action as part of the solution. House Bill 15-1088 seeks to address these challenges through direct grants to farmers. The bill would provide a total of $1 million in assistance to farmers for a five year period. Farmers can receive a maximum grant of $30,000 per year, and farms of any size are eligible. Healthier Colorado, a new 501C4 working in conjunction with the Colorado Farm to School Taskforce and the Colorado School Nutrition Association, has been essential to making the legislation a reality. The group conducted listening sessions throughout the state to identify Coloradan’s health priorities. Residents consistently identified the need for more fresh local food in the schools. Both Kathlene and West cite concerns about Colorado’s current education budget as the main objection to the bill in the legislature. Colorado’s funding for education has dropped significantly in the past five years. According to Greater Colorado Education, Colorado public schools served over 125,000 students but only received funding for 35,000. “Healthier diets are connected to better academic and behavioral outcomes in public schools,” states Kathlene, who also points out that House Bill 15-1088 supports small and mid-size producers, opens up new, stable institutional market for them, and generate economic activities in local communities.